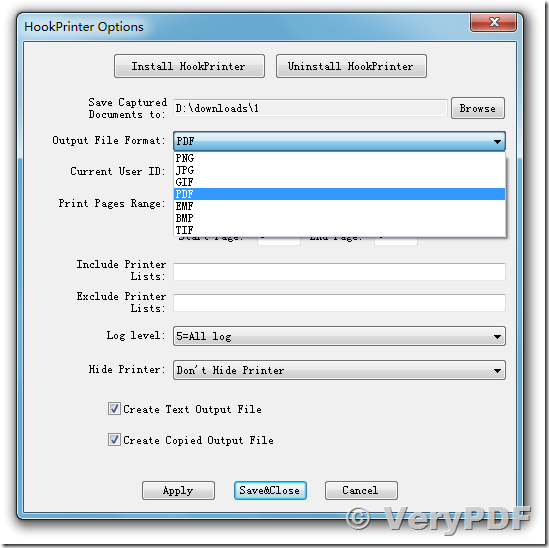 ← How to capture printer spooler file when printing and then view and/or print that spooler file again? I have one mainframe application through which we can send command for document printing. As this application is LAN based and it directly connected to printer on LAN, even though I changed default printer as 'PDFCreater' print command goes to printer on LAN. I want to create one application through which i can read data from printer port and save it into soft copy (pdf or excel) as required. Capture Windows Spool and save to PDF & TIFF formats. VeryPDF Document Capture is a desktop print diver, that allows you to hook all Windows Printers, capture printed documents, and save to PDF and TIFF electronic document formats from any Windows application. VeryPDF Document Capture is a Windows print driver designed to be used either as a stand alone single user electronic document capture utility or as a server based automatic electronic document capture tool. It can also be used as an interface into a larger server based application. It captures a printed document from the user and renders it into an Adobe PDF file or into a standard TIFF file. It can be configured to launch a viewer after capturing the document so the user can preview the output. Server configurations can be setup to capture without user interaction and can capture PCL print streams from non-Windows applications or non-standard Windows applications (such as legacy programs). Advanced configurations can be setup to capture print data arriving on an IP port like a network printer or monitor a folder for PCL data files or capture print data arriving over a serial port! After you install HookPrinter into your system, you can use it to capture any spool documents, you can also use it to convert spool documents to PDF, PNG, JPG, TIF, BMP, EMF, GIF, Text, etc. formats. It is a great software to intercept and capture Printer Jobs. How to convert documents of Microsoft Office Excel to EPI? This entry was posted in docPrint Pro and tagged forward printer, hook printer, intercept printer, redirect printer. Bookmark the permalink.